We’d love your help. Let us know what’s wrong with this preview of Paging Dr. Cupid by Nancy Fraser. Piano prodigy Grace Valentyne forfeited the second Newly appointed Chief of Emergency Medicine Dr. Garrett Langley can't seem to find a secretary to keep up with his demands. His love life isn’t going so well, either. He recently lost his long time girlfriend to his older brother and saw a workplace romance end in disaster, leaving him with a busy career but no love life. 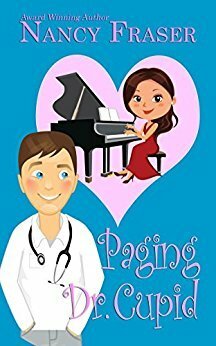 To ask other readers questions about Paging Dr. Cupid, please sign up. This book was such a fun and super short, easy read! At only 82 pages it didn’t take more than a couple hours to read it. And trust me; once you start you won’t be able to put it down! This book is extremely entertaining and true joy to read! I was drawn in right off the first few pages and although I was curious to find out how the story would end, I was in no rush to get to the end as I was enjoying seeing how the story unfolded. Grace Valentyne is a student at Julliard. However, her mom falls i This book was such a fun and super short, easy read! At only 82 pages it didn’t take more than a couple hours to read it. And trust me; once you start you won’t be able to put it down! Grace Valentyne is a student at Julliard. However, her mom falls ill and Grace leaves college to move in with her mom and take care of her. Sadly, Grace’s mom passes away. Now that Grace can’t afford to go back to Julliard she makes a plan to get a job, save up some money, and then go back to school in about two years tops – she says. However, It just so happens that at the same time Dr. Garrett Langley has just had his fourth secretary quit on him. He is new to the Emergency Department team and apparently his predecessor, Dr. Taylor, was a “lackadaisical womanizer” and left the department in disarray. So far all of the recently hired secretary’s seem to clash with Dr. Garrett and aren’t up to his standards. That is until Grace is hired to be his new secretary. There is an instant spark between Garrett and Grace. Their chemistry and passion just leaps off the pages! They are so entertaining and play well off each other. I found myself constantly smiling and laughing at the two of them! The main characters, Garrett and Grace are so realistic, genuine, and totally relatable. They both had been going through some difficult personal issues, but it only made them stronger, and more compassionate. I really liked Grace and Garrett. They each had wonderful characteristics on their own, but together, they were an even stronger couple. I’d imagine Grace and Garrett would be a couple you’d invite over for a dinner party or have them over for game night lol. This book was so well written, with great details, flowing sentences, and at perfect steady pace. This book is packed full of happy, fun, interesting, and intriguing scenes that truly make this book a romantic comedy! There is even a recipe at the end of the book that I will definitely have to check out. I was a little nervous about this book being set in the 1960’s. However, it honestly didn’t detract from the story; I actually found it to be more entertaining. For example, when Grace is wrestling around with “the metal monster,” also known as the typewriter lol. I wasn’t alive in the 60’s, but I do remember typewriters and yes they were super annoying and complicated to use, so I totally felt for Grace lol. I would absolutely recommend this book! You will not regret one minute of reading this book! But fair warning – once you start you won’t be able to stop lol! If you have read other novellas by Nancy Fraser you will certainly not be disappointed with this one! Thanks to netgalley.com for the ARC of this book. It is a very quick read that is set in 1967. It is a sweet old fashioned romance book. The characters are interesting and it is a clean romance story. This is a great book with a wonderful story and well developed characters. This book will keep you reading long into the night. This was such a great read and full of surprises. I am looking forward to reading the next book by this great author. I voluntarily reviewed an advanced reader’s copy of this book. The free book held no determination on my personal review. I really enjoyed this book it was a fun little read and i really enjoyed getting to know Garret and Grace.A great read would recommend. Nancy Fraser has been writing since she was a child, most often on walls and with crayons or (heaven forbid) permanent marker. Since first becoming published in 1996, Nancy has received numerous five star reviews for her futuristic, time travel romance. and is contracted for a series of ten vintage historical romances set during the Golde Nancy Fraser has been writing since she was a child, most often on walls and with crayons or (heaven forbid) permanent marker. and is contracted for a series of ten vintage historical romances set during the Golden Decade of Rock & Roll (1955-1964).